The holy month of Ramadan is upon us and throughout the Muslim world as the devout take part in the largest collective fast in history. Marking the month on the Islamic calendar in which the Quran was first revealed to Prophet Muhammad, fasting from dawn to dusk is one of the main pillars of Islam. This special time is also one in which the devout perform daily prayers as well as make an annual charitable donation known as "zakat." This year, the fast began on Tuesday, May 15 and continues until the evening of June 14. Devout Muslims refrain from eating food, drinking water and other vices throughout the daylight hours and then partake in the "iftar" meal, held after sunset to break the fast and "sahur," a meal before sunrise and start of the day-long fast. This dedication will then be rewarded with the beloved "Şeker Bayramı," Eid al-Fitr, in the greater Muslim world. Şeker Bayramı, which translates to "Sugar Holiday," is a three-day holiday, which will take place from Thursday, June 14 to Sunday, June 17, to celebrate the previous month of self sacrifice by taking a holiday and enjoying the finer things in life. Mass gathering for the first iftar of this year's Ramadan in Sultanahmet. If you are in Turkey during this very special time and less familiar with this tradition then what you need to know most of all is that this is a time in which people try to spend time with their families, help others less fortunate and of course fast. With this year's dates falling in the summer months, this month-long fast will be a more trying time than most. Keep this fact in mind in the public sphere, and whether or not you are fasting, just try to be a little bit more accommodating, understanding and patient; in other words, be kind and when possible, give helping others a try. 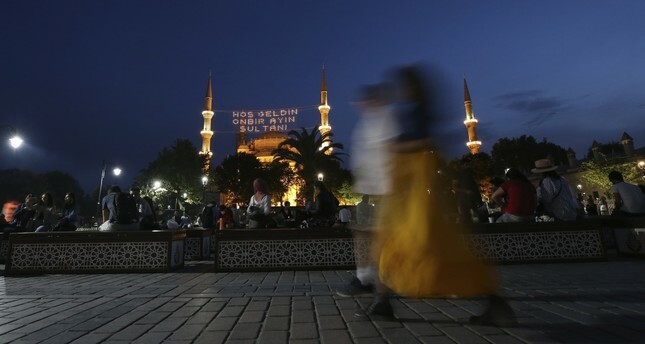 While, it has been a long-standing tradition for people to flock to Sultanhamet Square and enjoy the night air and festivities in the city's most historic neighborhood, this year in Istanbul, the Metropolitan Municipality will host three other month-long celebrations to safely enjoy Ramadan festivities. For those on the Asian side, the Maltepe Seaside, Europe's largest lifestyle, sports and entertainment center at 1.2 million square meters, will host month-long activities, and on the European side, the Yenikapı Seaside, another mega outdoor complex that has a 1 million person capacity, will also host events for Ramadan. Additionally, on the European side, for the first time ever, there will be month-long events taking place in Beylikdüzü Square. Each location has a Mosque nearby where people can take part in the Tarawih prayer. Yabangee, the website run by and geared to foreigners in Istanbul, continues their Expat Spotlight talk series this month with a focus on "Social Innovation," which is apt during this month in which helping others is a major component. This talk series, held at ATÖLYE in Bomontiada, is a monthly series showcasing the freshest, most inspiring contributions by Istanbul's diverse international community to the city's cultural, sporting and humanitarian and business spheres. Open to all, with free entrance and no RSVP required, this event series takes place in English and provides an opportunity for expats to share moving stories, reflect on personal experiences and participate in a resourceful dialogue. The Expat Spotlight on "Social Innovation" will take place on Tuesday, May 29 at 7:30 p.m., with doors opening at 7 p.m. The Master of Ceremonies for the evening will be Jessica Sim of Circuit Istanbul, while the speakers will be the founder of Istanbul&I Teymour Ashkan, Alexandra Clare and Marcello Bonatto from Re:Coded, Niels van der Linden from Patica and Susan Long, who is involved in making communities in the humanitarian aid sector.